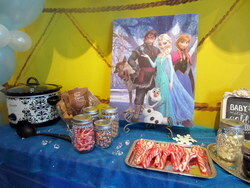 Maddie loves Disney's Frozen and her mom loves to throw beautiful, "over-the-top" celebrations for her sweet girl. Mom wanted to work with us on a custom Frozen celebration that went beyond the Luxe, with opulent fabrics, a 200 piece sweet table, a crown balloon arch, and beautiful accents in frames and vases around the room. We assembled a team that we knew was up to the challenge, and had a blast pulling it all together. First on our list was securing the princesses. For this celebration, we went with one of our favorite character companies, which always delivers with high quality costumes and impeccably trained actresses. Mom knew a crown-shaped arch would be the perfect way to frame the hot chocolate bar, so we added it to the to-do list, along with the character balloon decorations. Guests enjoyed chocolate chips, sprinkles, and marshmallows with their Starbucks cocoa, stirred in with peppermint spoons. Joanna's baking team designed sweet table was the focal-point of the decor, with a two layer fondant cake, cupcakes, cake pops, dipped lollipops, marshmallow pops, and oreos. All done in Frozen characters and surrounded by glittery branches atop beautiful fabric. All of that sugar calls for a refreshment so we created a special Frozen sparkling drink to help keep everyone properly quenched. Maddie's mom added framed photos and vased ornaments to accent the room. With a space as adorned as this one, it's only fitting that the children should be properly adorned as well! The wonderful and talented Star McFarlane joined us for face painting. The birthday girl modeled a crown created by balloon twister Robert Hirsch of Magical Balloons. Cute as a Button Photography provided stunning photos to commemorate the day. Happy Birthday Maddie! We hope you had as much fun with your party as we did!